Packages include prime seating, parties, events with exclusive artist access, and meal service between performances. There are two package choices available and both begin on Friday, January 25 and end on Sunday, January 27. The first presentation for Package A is Friday afternoon, while the first presentation for Package B is Friday evening. The final presentation for both packages is on Sunday. Packages are $120 + the price of your ticket to The Carpenter. The deadline to purchase a package is January 18. 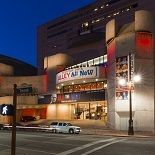 Go here for information about the plays in the 2019 Alley All New Festival. Go here for the full festival schedule. Go here for information on accommodations, transportation and restaurants. Information on accommodations, transportation and restaurants so you can make the most of your time at the Alley All New Festival.